The orange-breasted green pigeon (Treron bicinctus) belongs to the family of doves and pigeons, the Columbidae. The orange-breasted pigeon species is distributed in India, Nepal, Bhutan, Sri Lanka, Bangladesh and southeast Asian countries. These green pigeon species are non-migratory and are resident birds. These pigeons are polytypic species. The orange-breasted green pigeon (Treron bicinctus) is a slightly large pigeon, measuring 30 cm in length and weighing 155 to 200 grams. The overall plumage of the orange-breasted pigeon is green. The head, back and wings are olive green. The female has a gray area on the head. The forehead, face and throat are greenish yellow. The belly region is greenish yellow. In male orange-breasted pigeon, the upper breast has a narrow band of lilac and the lower breast is orange. The undertail-coverts are beige-brown with the longer feathers edged pale yellow. The upper tail is gray with a broad, dark subterminal band. In females the breast is yellowish. The bill has pale blue upper mandible and pale greenish yellow lower mandible. The irises are whitish and there is a brownish eye ring. The legs and feet are reddish. The call of these pigeons is a rising, nasal whistle followed by a rapid sequence of gurgling sound. 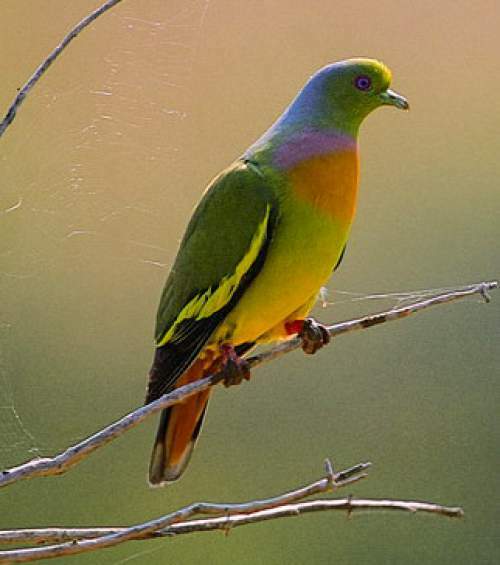 The orange-breasted green pigeon species is distributed in India, Nepal, Bhutan, Bangladesh, Sri Lanka, Myanmar, Thailand, Cambodia, Laos, Vietnam, China (Hainan Island), Malaysia and Indonesia. Vagrant birds were observed in Pakistan. The orange-breasted green pigeon nominate subspecies X. s. sabini is distributed in India, Nepal, Bhutan, Bangladesh, Myanmar, Thailand, Cambodia, Laos, Vietnam and Malaysia. 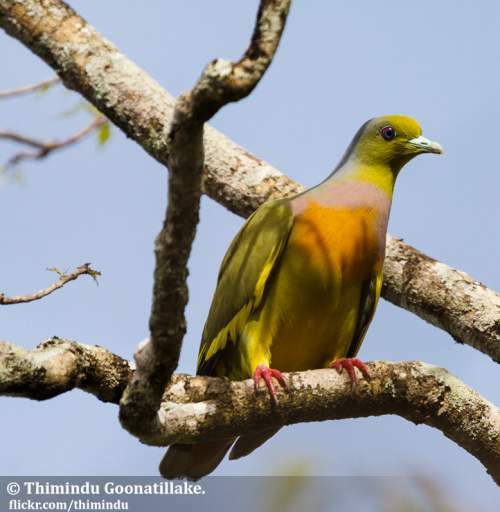 The orange-breasted green pigeon subspecies T. b. leggei is distributed in Sri Lanka. The subspecies T. b. domvilii is distributed in Hainan Island (China). The pigeon subspecies T. b. javanus is distributed in Indonesia (Java and Bali). In India, these pigeon species are distributed in the states of Uttarakhand, Uttar Pradesh, Bihar, West Bengal, Assam, Meghalaya, Arunachal Pradesh, Nagaland, Manipur, Tripura, Mizoram, Odisha, Jharkhand, Chhattisgarh, Madhya Pradesh, Maharashtra, Telangana, Andhra Pradesh, Karnataka, Tamil Nadu and Kerala. These orange-breasted green pigeon species have moderate forest dependence. They normally occur in altitudes from 0 to 1500 meters. The artificial ecosystems and habitats of these pigeon species include plantations, orchards and heavily degraded forests. 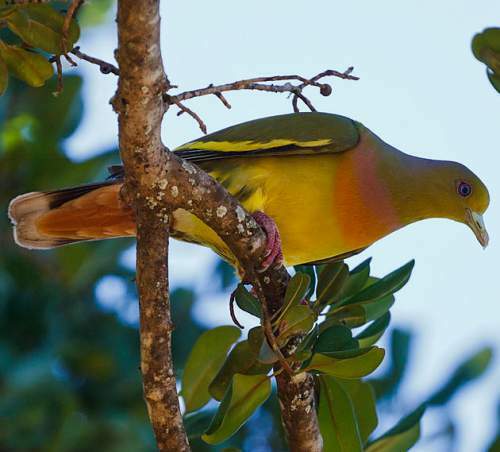 The natural ecosystems and habitats of these orange-breasted green pigeon species include, subtropical and tropical moist lowland forests, subtropical and tropical mangrove forests, moist lower montane forests, foothill forests, wetlands, marshes and peatlands. The diet of these orange-breasted green pigeon consists mainly of fruits. Wild fruits, berries, figs and cultivated fruits are their primary food. They feed on several types of figs and berries, guavas and wild palm fruits. They usually forage on the branches of fruiting trees. These orange-breasted green pigeons are known to feed on the fruits and seeds of the strychnine tree (Strychnos nux-vomica). The intensely bitter alkaloids, strychnine and brucine, present in these plants are highly toxic to mammals. The breeding season of these orange-breasted green pigeon species is from March to September in India with a peak in April to July. They breed all around the year in Sri Lanka, with a peak in December. These pigeons are monogamous. The nesting sites of these pigeons include fork and branches of trees and shrubs. The nest is a flimsy platform of twigs and sticks. The clutch typically contains two white eggs. Both the parents incubate the eggs and take care of the nestlings. The chicks of orange-breasted green pigeon hatch out in 12-14 days and are altricial. The nestlings are initially fed with regurgitated crop-milk, a secretion from the lining of the crop of parent birds. Later the nestlings are fed with regurgitated fruits, seeds and plant matter. These orange-breasted green pigeon species are non-migratory and are resident birds. The populations in higher elevations may come down to lower elevations during winter. Post breeding, the juvenile orange-breasted green pigeons may disperse and establish in new locations within the range. They may make local movements for feeding and breeding within their range. The global population size of the orange-breasted green pigeon (Treron bicinctus) has not been quantified. The overall population trend of the species is considered to be decreasing. Throughout its range, this orange-breasted green pigeon species is reported to be uncommon to fairly common. The generation length is 4.2 years. Its distribution size is about 12,200,000 sq.km. Habitat alteration and destruction and capture of adults and juveniles for pet-trade are the main threats that are endangering the survival of this pigeon species. The orange-breasted green pigeon (Treron bicinctus) does not approach the thresholds for being Vulnerable either under the range size criterion, or under the population trend criterion or under the population size criterion. The IUCN (International Union for Conservation of Nature) has categorized and evaluated the pigeon species and has listed it as of "Least Concern". The CITES (Convention on International Trade in Endangered Species of Wild Fauna and Flora) status is ‘Not Evaluated’ for orange-breasted green pigeon (Treron bicinctus). The orange-breasted green pigeon (Treron bicinctus) is closely related to pink-necked green pigeon (Treron vernans). The four recognized subspecies of the orange-breasted green pigeon (Treron bicinctus) are: Treron bicinctus bicinctus (Jerdon, 1840), Treron bicinctus leggei E. J. O. Hartert, 1910, Treron bicinctus domvilii (Swinhoe, 1870) and Treron bicinctus javanus Robinson & Kloss, 1923. Current topic in Birds of India: Orange-breasted green pigeon - Treron bicinctus.